Learn how to set up the Portfolio WordPress theme. This is a 20 minute video walkthrough of setting up your site to look like Portfolio’s demo site. Click the thumbnail below to play. 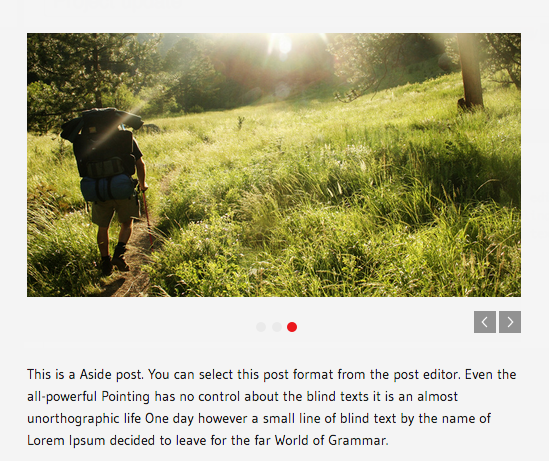 Portfolio supports 3 post formats, selectable from the Edit Post screen: standard (text), Aside (Updates) and Image. The post format you choose determines how your post will look. Note: The Featured image will be included at the top of the post and includes a link to the single post view. Portfolio adds a set of buttons to the visual editor; these buttons allow you to easily format your content with Portfolio’s custom typographic elements. View the styling example page to see these various buttons in use. Save the post, and you’ll now see your post in the slider! In your WordPress dashboard, navigate to the Appearance → Theme Options page. Under the “Logo & featured slider” section, you can toggle the featured slider’s autostart behavior as well as choose the animation effect for the slider (fade or slide). Enabling a slideshow slider on a page or post is as easy as adding a gallery to your page or post and modifying the shortcode. 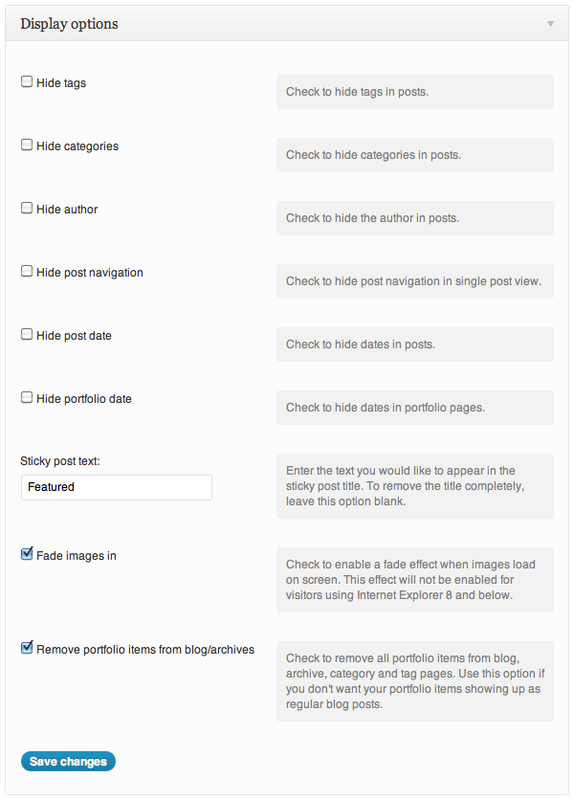 Note: Using the regular [gallery] shortcode will remove the slider styling and return to the default WordPress gallery. Setting up your portfolio involves 2 main tasks: creating your portfolio items and placing them on your portfolio pages. Portfolio items and pages can be created in any order, and we’ll go over the process for setting them up in detail. You’ll notice the words portfolio item are always in italics – this is because a portfolio item is just a regular old WordPress post with some extra information associated with it. In the following sections you’ll learn how to set up your portfolio items, but if you remember: “A portfolio item is just a post” our instructions will (hopefully) make more sense! Save/publish your post, and you’re done! The Aside and Image formats cannot be used for portfolio items. Portfolio items on the Homepage are order by date. To change the order of your items, you will need to alter your post’s publish date. One of the nifty features of portfolio items is the extra details you can add to the sidebar. This is demonstrated on the demo site, and it’s actually pretty simple to set up! Portfolio Theme uses the manual excerpt of a post to populate this information. The “Click to show excerpt HTML help” button provides you with instructions about inserting quotes and buttons into the excerpt. Manual excerpts are typically short explanations of the post. For your portfolio items, you may want to use the excerpt to include some detailed information about the item: project dates, client names, or materials used – really, anything that is relevant to this project. Whatever you put in the excerpt box will be used to fill in the sidebar of your portfolio item. If the excerpt box is left empty, the sidebar will not appear. The text you put here will be used on the Portfolio and Homepage page templates instead of the default text. Portfolio pages display your portfolio items in grid format, allowing your visitors to browse the items and click through to the items that interest them. To create a Portfolio page, go to Pages → Add New on your admin dashboard. Select the “Portfolio” template, give your page a title, save the page and you’re done! 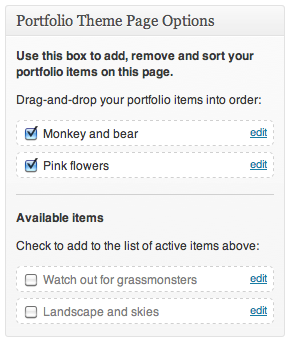 This box allows you to add, remove and rearrange your portfolio items on the page easily from the Edit Page screen. Check/uncheck items to add/remove them from the page, and drag checked items to reorder them. Click “Update” to save your changes, and the items on the page will be updated. To create your Homepage, go to Pages → Add New on your admin dashboard. Select the “Homepage” template, give your page a title, save the page and you’re done! The Homepage template is made up of 2 major elements: the recent portfolio items in the footer, and the featured slider. 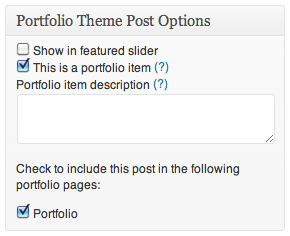 The recent portfolio items are automatically populated using the 3 most recent posts marked as portfolio items. Portfolio also includes three other page templates: default, “With Sidebar” and Sitemap. The default template is “full-width” and will display your content without a sidebar. The “With Sidebar” template will add your sidebar to your content. The Sitemap template builds a user-friendly sitemap automatically linking to your pages, posts, categories, tags and archives. Pages can also use Featured Images. When you set a Featured Image for a page, it appears above the content as seen on the demo site About page. To set a Featured Image, check out the “Setting a Post Thumbnail” section of this Featured Image tutorial. The Accent font is used for blockquotes. In addition, you can change the primary color for your site. The primary color is used primarily for link coloring, but is also used for buttons and other accents. Portfolio allows you to easily remove the author’s name, post navigation, post date, tags and categories from the post display. In your WordPress dashboard, navigate to the Appearance → Theme Options page. Under the “Display options” section, check the appropriate options to prevent them from displaying on all posts and pages. Within the “Display options” section, you also have the choice to toggle on or off Portfolio’s unique image loading effect, and the option to set a custom sticky post title. Under the “Subscribe links & copyright” section of the Appearance → Theme Options page, you will find the input field for your footer Copyright text. By default, this field is left empty. When viewing the Homepage template, you can use the left and right arrow keys on your keyboard to navigate through images in the Featured Slider.